You’ve probably already heard about the rise of automation in business. You’ve no doubt heard, for example, about the seismic effect that automation is expected to have on the modern workforce, with Forrester predicting 7% of all US jobs to be affected by 2025. In addition, 93% of automation specialists surveyed stated that they felt unprepared for the changes ahead. Yet the analyst firm also predicts that automation will lead to the creation of 8.9 million new jobs that specifically focus on automation. So what does this all of this mean? All this means that automation in business offers substantial opportunities to those who are ready to take that next step forward. Automation meant an additional $14M in funding for Tray.io. How much will it mean for you? By way of example, here’s how much automation means for Amazon, the most successful retailer on the planet. Using process automation, it has been able to make smart enhancements to its operations, like storing 50% more inventory while requiring less than a minute of manual labor. With the significant efficiency gains afforded by automation, the company grew its Q1 revenue 43% year-over-year to $51B, more than doubling its net income. Amazon aren’t the only ones using automation to achieve incredible success. 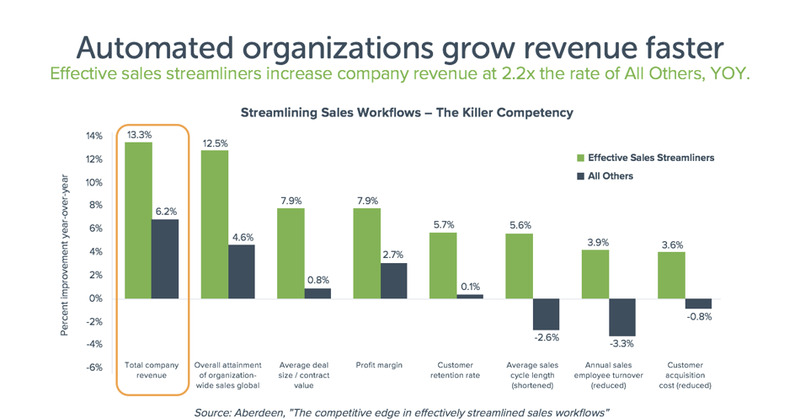 According to research firm Aberdeen, companies that use business automation see extraordinary gains over those that don’t, to the tune of 220% higher revenue growth, 290% higher profits, and sales deals that average 900% higher value. The numbers don’t lie - automation provides clear benefits for companies that use it. How does automation provide such sizable gains? Successful companies get ahead by using automation to close the loop on time-consuming, inefficient processes. The kind of processes that bring operations to a screeching halt, such as syncing up disparate business systems that don’t work well together, or managing huge amounts of data across these different systems, or manually taking on tedious, time-consuming tasks because up until now, there hasn’t been a better way. By using the power of a General Automation Platform, business users at companies all across the globe are becoming citizen automators. These are business users in any function - not just in IT - be it marketing, sales, customer success, operations, finance, or HR, among others. DigitalOcean use Tray.io for marketing. AdRoll use Tray.io for sales. Vox Media use Tray.io for customer success. Vestorly use Tray.io for finance and operations. And that’s just the beginning.